Jason Agliam got his historic strike on his 13-foot IRW pole. It arched over and Jason's 454 Newell screamed out 80-lb test Ande line as a call to battle against the king of the reef. Jason went toe-to-toe with his rampaging South Kona monster until it was finally gaffed and pulled on the rocks. 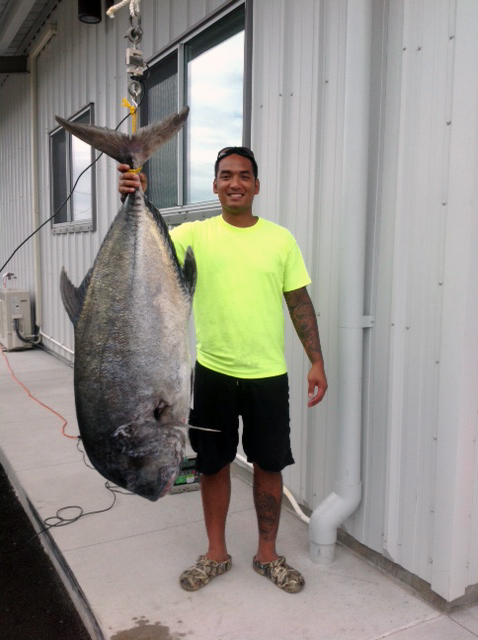 At S. Tokunaga Store, the ulua of his dreams weighed in at 102.2 lbs.